You're probably asking yourself "another Beatles biography?" as you start reading this post. You'd be entirely justified in wondering just how many biographies on the band are really necessary. Indeed, while there have been many excellent books on the various aspects of the band's life and career, the publication in 2013 of the first volume of Mark Lewisohn's epic three-volume biography of the band almost instantly made it the definitive Beatles bio, just about relegating all that has come before as superfluous. However, the biography by Hunter Davies that is the subject of the present review is still required reading for any serious fan of the Fab Four. Why is that, you may be asking yourself? 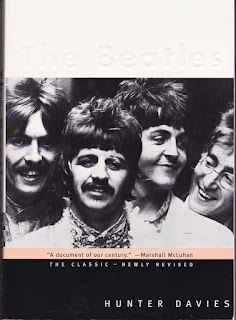 While it's quite a good book in its own right, the fact remains that it is and always will be the only authorized biography of the Beatles, done with their consent and direct input, written, researched, and published in 1968 while they were still a vibrant, active, and working band at the height of their powers. For that fact alone, it has a secure place in history; the fact that it's an interesting book and a true product of its time and circumstances enhance its standing. Seasoned Beatles fans will know that Hunter Davies has written additional books on the Beatles in the years since 1968, notably his recent John Lennon Letters and Beatles Lyrics books, both of which have been reviewed on this site previously. However, he is first and foremost known amongst fans of the group for this biography, which has been continually in print since 1968. There have been several updated editions, all of which are worth seeking out as the prefaces and afterwords Davies has written in the intervening years are quite enlightening (and in actuality, adding the prefaces and afterwords up gives a page tally approximately equal to the original biography itself!). Much of the prefaces are taken up with describing the backstory of how he came to write the book, as well as how much editing went into the final manuscript. These are fascinating bits of information to read and worth discussing in their own right. Davies was a published author and columnist in 1966 whose novel Here We Go 'Round the Mulberry Bush was being made into a film. While interviewing Paul McCartney in the summer of 1966 for a feature on the Beatles' upcoming album Revolver and the single from it, "Eleanor Rigby," Davies asked Paul two questions: would he compose the soundtrack for the film? (Paul was interested but ultimately passed...the soundtrack ended up featuring the Spencer Davis Group and their new offshoot, Traffic). And what would Paul think if he (Davies) were to write an authorized biography on the Beatles? Paul seemed interested in this and gave Davies permission to broach the subject with manager Brian Epstein. After getting approval from all of the Beatles, their family, and their friends, Epstein and Davies negotiated a contract in early 1967 and the project was started. Davies began by interviewing Beatles family members, friends, and associates, and then reported back to the individual band members to corroborate facts, see how it spurred their own memories of events, and conduct in-depth interviews with them. He also shadowed them for much of 1967 and 1968, both in the studio, in their homes during songwriting sessions, and as a fly-on-the-wall for many day-to-day occurrences. His involvement with the band ended shortly after their return from India in the spring of 1968 as they began work on their self-titled double album (aka the White Album). The book roughly follows the lives and careers of the Beatles chronologically, starting off with their childhoods in wartime Liverpool and, in the case of John and Paul, the tragedies of them both losing their mothers while they were teenagers. From here, Davies traces the meeting of the two in the summer of 1956 and, bringing George (a childhood friend of Paul's) into the fold a year later, the origin of the band that would eventually become the Beatles. The story of how they morphed from the skiffle Quarrymen to the rock and roll Beatles, settling on a line-up that also included Stu Sutcliffe on bass and Pete Best on drums, is well known and doesn't bear further repeating here. The same goes for their apprenticeships in Hamburg at the various clubs and dive bars they played while there. However, an interesting part of Davies' book is that he did manage to interview Pete Best, who offered some rather pathetic (in the literal sense of the word) yet interesting morsels of information regarding his time in the band and his feelings about being sacked. Once Ringo entered the picture in the summer of 1962, their story is so well known that, again, I won't waste your time or insult your intelligence by repeating it here. The Beatles recording career, as the public acknowledges it, is covered in the book from 1962 through early 1968, again in roughly chronological order. First tracing their slow but steady rise to the top of the UK scene under the tutelage of Brian Epstein, Davies spends the bulk of the book on the Beatlemania/touring years of 1963-1966, with a handful of revealing tidbits from the Beatles themselves. However, it's the section of the book dealing with their lives and careers between 1966 and mid-1968 (when his interviews ended as he prepared to go to publication) that offer the most revealing insights into the inner workings and hive mind of the band. It's almost certainly with the benefit of hindsight, as no one at the time could have predicted what was to come with the band's unraveling in 1970, but there are numerous candid comments by all of them, but mainly George and John (no surprise there) at how Paul was now their defacto leader, how they wouldn't care if it all went away in a flash, and how they on one hand could see the band continuing on for a long time, yet on the other hand knowing it wouldn't last. Even those around them, such as George Martin, Neil Aspinall, and Mal Evans (all also interviewed for the book) offered some off-the-cuff remarks to the same effect. What's interesting is that the comments about Paul being their driving force post-Brian were made not in snide, accusatory tones, but with almost thankful admission. This was particularly revealing coming from John, who would later use this aspect of Paul's personality as a verbal cudgel once they commenced their very public feud between 1970 and 1973 (keeping in mind that anything John said about the Beatles and McCartney in the immediate aftermath of the band's split was said out of hurt and anger, often hyperbole, and said just to be contrarian and dramatic, as Lennon himself admitted years later). This one and only authorized Beatles biography is a time capsule of an age gone by, one that was changing at a rapid pace yet was still more innocent, fun, and naive than the present. Hunter Davies did an admirable job capturing this essence and really humanizing the Beatles, who at the point he got them were already viewed as gods removed from the rest of us by fans, critics, and academics alike. The book did a great job in stripping away a lot of the myth in order to show them as they really were: four very young, very talented, very successful men who got to where they were by skill, sheer hard work and determination, and smatterings of luck along the way. It also froze them in place and time as they never would be again; in mid-1968, John was married to Cynthia, George was married to Pattie, Ringo was married to Maureen, and Paul was engaged to Jane. Within less than six months of the book's publication, John was with Yoko, Paul was with Linda (both of whom the two Beatles would respectively marry in early 1969 and remain married to until Linda's and John's deaths); within five years Ringo and Maureen were separated and headed for divorce, as were George and Pattie. Combined with the chaos of Apple Corps., the arrival of the wicked Allen Klein, the eventual bitter lawsuits, the acrimony, and the sniping in public and private between the four of them, the entire Beatle empire began to crumble to dust around them almost as soon as this book was released. Indeed, Davies' postscript, added to the 1985 edition, is along these same lines and is as valuable and worthy an addition to the book as anything originally in it. Speaking of that, while there are some surprisingly candid admissions throughout (such as Cynthia Lennon admitting that if she hadn't gotten pregnant, she and John wouldn't have gotten married), Davies laments the censoring he had to agree to after finishing the manuscript in order to appease the four Beatles, or in reality their families. Unsurprisingly, the two most difficult thorns in his side were John's aunt Mimi and Brian Epstein's mother Queenie, both of whom wanted their respective son's lives whitewashed, facts be damned. In Mimi's case, she took issue with John's recollections of his bad behavior at school and with his friends during his childhood, while in Queenie's case any mention of Brian's homosexuality was off limits. Davies did leave in some daring and rather cheeky references to Brian as "gay" in the original book, playing off the original connotation of the word as a synonym for "happy" while still making it obviously clear in context what he really meant. But the mores of the time, as well as the need to please everyone involved, meant that some major cuts needed to be made. Because of this, I've long hoped for an unedited original manuscript of the book...Hunter, if you're reading this, how about it? The book is very readable and enjoyable although it does tend to read as a series of Davies' shorthand notes fleshed out into sentence and paragraph form, at times the prose coming across a bit stilted. There are also several small errors, mainly in dating certain photos or events. However, he achieved some real coups for the time, such as tracking down and interviewing Pete Best, Richard Starkey (Ringo's estranged father), and Fred Lennon (John's estranged father). Apart from the errors and the rather repetitive nature of several passages, the book holds up remarkably well and must be resonating well enough to remain in print continuously since the first edition almost fifty years ago! 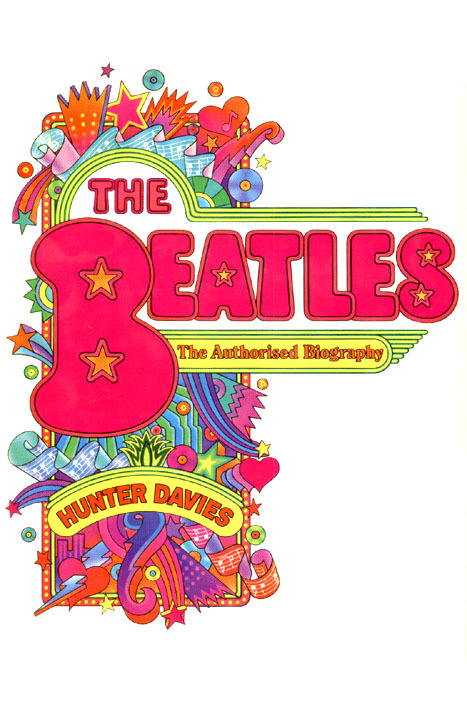 Essential reading for any Beatles fan, Hunter Davies book is a slice of life directly from the Beatles that chronicles their story from (mostly) their own recollections, catching them at their peak when the possibilities seemed endless and the successes effortless. Like the band, the book is of its time yet also timeless. It also holds up well to repeat readings, something I can personally attest to. While he was rather self-deprecating in his forward, Davies should hold no regrets with respect to his achievement with this book, although somehow I think that deep down he must know what the rest of us do when it comes to The Beatles: nothing has changed. 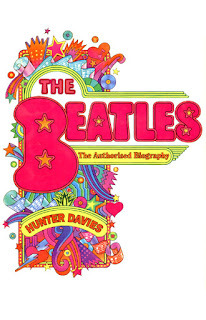 Just as the prevailing thought in 1968, the Beatles will go on forever in some form or another, and so will this book.